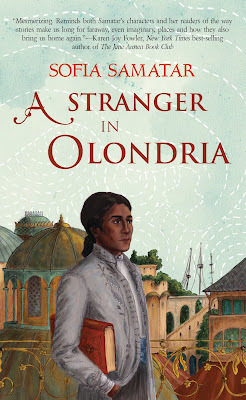 All of the reviews I’ve read about A Stranger In Olondria talk about it being about bibliophilia, that is, the love of books. The love of books certainly does run through the novel, but I actually think it’s more about spirituality—with the written word being the locus through which transcendence is achieved. The form the novel takes is the bildungsroman: a novel about the initiation of a youth into the wider world. Jevick is the son of a prosperous pepper merchant, a tyrant of a man who has two wives and controls a plantation on a tropical island. When it becomes clear that Jevick’s older brother is unfit for inheritance, Jevick is trained to be his father’s successor. A tutor from the distant, northern land of Olondria is hired, ostensibly to teach young Jevick the language and customs of that land in order to be a competent trader. But the tutor instills in the boy a love of the written word and an obsession with the exotic land. Jevick eventually travels to Olondria on his first routine trade trip, and—very much against his will—becomes literally haunted by the ghost of Jissavet, a young woman and fellow islander he met on the voyage from the Tea Islands. Ghosts, in a heretical Olondrian religion, are considered angels, and those who communicate with them are living saints. When Jevick’s haunting becomes public knowledge, he is placed under arrest and becomes the unwilling pawn between two religious factions. In spite of this fairly complex set up, the novel isn’t about politics. The narrative form is that of the memoir, or its even more antiquated cousin, the philosophical romance. Jevick’s narrative meanders, often interrupting the narrative flow to quote poetry or bits of Olondrian philosophy. It’s slow, and richly descriptive—a marked difference the often breakneck pace of other fantasy novels. At times, the book becomes a travelogue—kind of like the books written by John Berendt (e.g., Midnight in the Garden of Good and Evil). Because of this solemn quality, the magic and the world-building is organic and believable. Other times, it has the elegiac melancholy of Hermann Hesse’s novels (particularly Steppenwolf and Siddhartha). The land of Olondria is a character. The country has a Mediterranean feel, in its fauna and cultures. The imaginary religion borrows from Hinduism and Egyptian mythology with a dash of decadence, resonant of the Greek mysteries. The novel’s ending is ambiguous; no magic ring is recovered or kingdom conquered. Rather, Jevick, and Olondria itself, are spiritually changed. A Stranger in Olondria is a richly rewarding experience for those who love prose poetry and non-traditional narratives. Sofia Samatar’s debut novel is a fine exemplar of bibliomancy.